The Scouter is a totally unique air rifle with a skeleton 'Shark Fin' styled stock, it offers a perfect mid sized rifle for juniors, or amateurs looking for an upgrade. 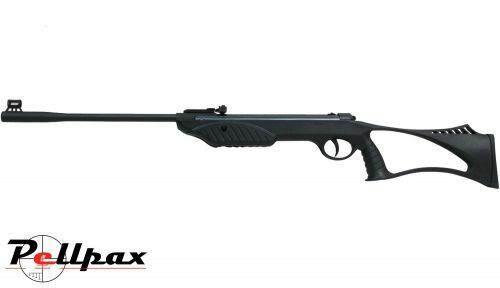 With a shrouded barrel, synthetic stock and auto safety, this rifle is perfectly designed for target shooting at clubs or in back gardens to get started where its impressive accuracy can really shine. The Scouter's stock has been designed to maximise comfort and lightness without sacrificing strength and is ideal for younger shooters. Total Length - 102cm / 40"
Barrel Length - 42cm / 16.5"
Add this item to your basket & spend an extra £400.01 to apply for finance.